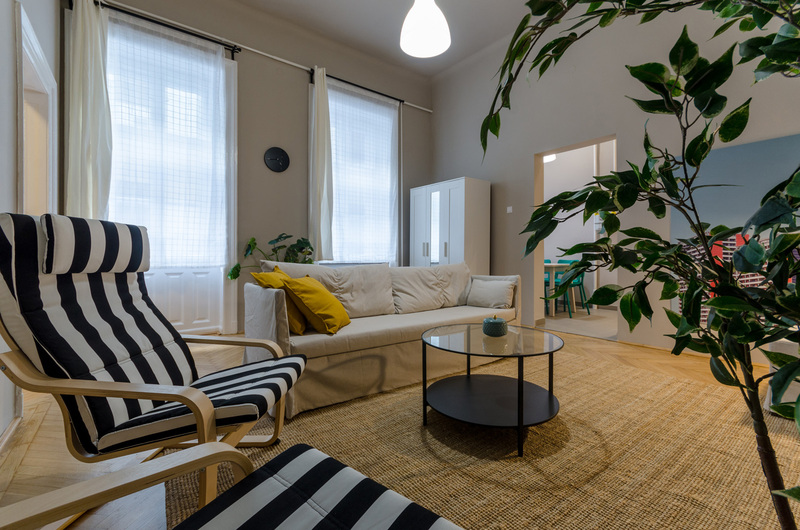 Boldo Apartment is in a very central position, this apartment offers great pleasure for those who wish to soak up the unique vibe of Budapest. Ideal for friends and families in the middle of downtown. Boldo Apartment is an exciting downtown flat with a bohemian atmosphere. With its good layout, this airy apartment on the first floor is the ideal place for you to recharge after your strolling. In the bedroom, two double beds, and a pull-out couch in the living room make it possible that six people can rest in the flat comfortably. The kitchen and dining room is ready for feasts. Akácfa street is one of the party streets with its huge selection of trendy clubs and fancy bars. A few minutes from the flat, you will find the Dohány Street Synagogue, the biggest functioning Jewish church in Europe. Within 5 minutes walk, you can reach Blaha Lujza Square, i.e. the core of the city. From there you can map the whole capital by metro, bus or tram. Castle Hill or Városliget are less than 20 minutes away.